Are you aware CMS has rated your agency on a 5 star scale, and made this information public? The star rating system was released July 16, of 2015 and CMS views this as “another step forward in [their] continuing efforts to empower consumers”. This new rating system will serve to attract potential referral sources such as providers, hospitals or health networks looking to partner with your agency, and help you focus on improving care provided to patients. This presentation will review the background and components of the Star Rating system, examine how it is integrated with home health compare, and how to use Star Ratings for long term success. 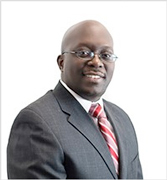 Dr Andrew Awoniyi, an industry expert on Home Health Compare and star ratings will present this key development and how your agency can utilize to remain competitive and achieve greater success. Dr Andrew Awoniyi is a doctoral prepared nurse with over 20 years of experience in health and information technology, working across interdisciplinary teams in multiple care settings to leverage their data for transformation initiatives. He has led the Axxess accreditation services, permitting thousands of clients to achieve and maintain their Joint Commission (JC), Community Health Accreditation Program (CHAP), and Accreditation Commission for Health Care (ACHC) accreditations and other continuing education requirements. He has also led the development of the Axxess CAHPS program since its inception, working with hundreds of agencies to more effectively leverage their HH-CAHPS surveys for continued success.